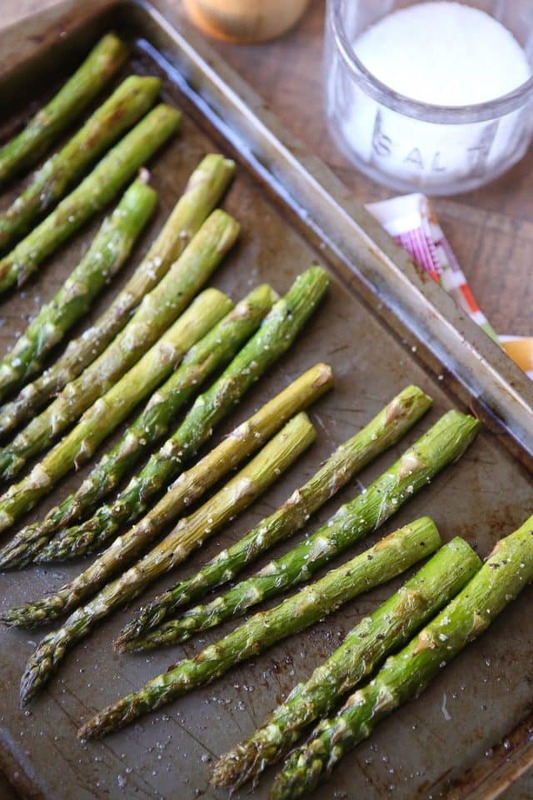 It’s not a secret that asparagus is a powerhouse when it comes to nutrition. 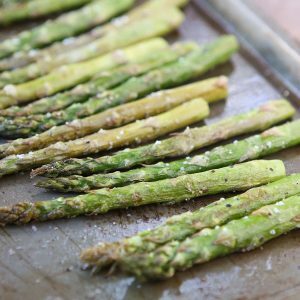 There are so many health benefits that come with a serving of asparagus which explains why it makes such a great option for a healthy side dish. 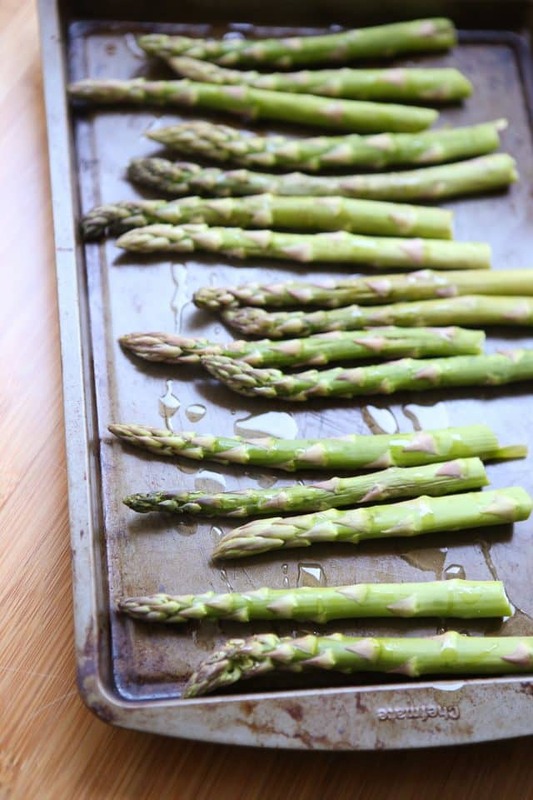 To prepare asparagus, first rinse them well under water. Place on a towel to dry completely, meanwhile trimming the ends of the woody stalk by snapping them. They will usually break easily and naturally where the tender stalk begins. 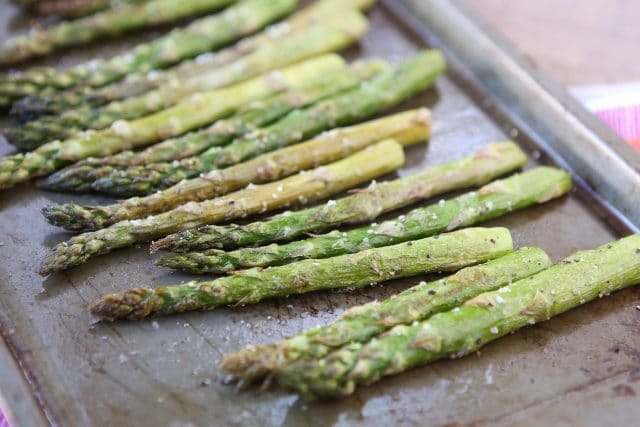 I like to season the asparagus directly in the baking sheet with a drizzle of oil, then tossing the asparagus to ensure they are coated evenly with the oil. A generous sprinkle of salt and pepper is next and into the hot oven they go. I love eating roasted asparagus alongside a fish, pork or beef meal. This Tart Cherry Ginger Teriyaki Salmon recipe from my friend Sandy recently caught my eye (she makes the BEST salmon dishes!) as well as these Grilled Pineapple Chili Pork Chops from my friend Dara. This London Broil with Mustard, Balsamic and Garlic Marinade is a very popular recipe from my site from years ago that pairs up perfectly with this asparagus as well as this Slow Cooker Asian Citrus Pork Tenderloin. Simple is best! I love it, Aggie!! Gorgeous! Tried it yesterday and my family loved it, also added some coconut oil for extra flavor and aroma, it was delicious , thanks for sharing. that’s awesome, thanks for the feedback! I’m going to try it with coconut oil next time! One of my favorite sides, especially in the spring! YUM! We often use as asparagus in soup only at our coffee shop. But I hope your this recipe will help us to serve it in a different way. Thanks Aggie. Yumy !!! its looks very nice and well cooked. delicous. i will sure try it. I have read about asparagus that Asparagus is the perfect superfood to eat in the spring season. I want to tell that I just loved the recipe and I m gonna try this one. It looks healthy to me. If I don’t use olive oil, is it test well? I will try this soon. Very interesting,will surely try to make and eat,good job and thanks for sharing such a good recipe.